This isn’t the Onion (though they have their take), this is real life. People with potentially no other reason to care about your church are beating on the door, thanks to Pokémon Go. Here’s what happened: Nintendo launched Pokémon Go, a smartphone app last Thursday. The app is an augmented reality game that uses GPS to make Pokémon characters appear in real-world locations. The game became a viral phenomenon over the weekend, gaining more active users than Twitter and adding $9 billion in market value to Nintendo. Also, it’s wracking up stories of injuries, armed robberies and other calamities. OK, aside from Westboro picking fights as usual, why should churches care? Because apparently tons of churches are already set up as PokéStops or gyms in the game, sending tons of people to churches over the weekend (even prompting a Babylon Bee article, the Onion for the Christian world). Yes, people with potentially no other reason to care about your church are beating on the door, thanks to Pokémon Go. And churches are responding. There’s a healthy buzz in Facebook groups and church staff are trying to figure out what to do, from adding “Welcome Pokémon Gamers” signs to offering Pokémon coloring sheets or collectibles. One church put out a cooler with bottles of water bearing labels inviting gamers back to church. 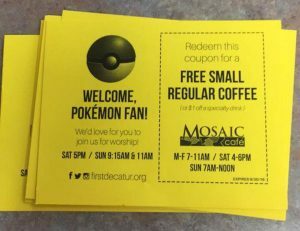 Seriously, go read Aaron Earls’ post for some great Pokémon Go tips and ideas for your church. He’s not nearly the curmudgeon I am. Steve Fogg has a few more ideas. As does Joe Gallant. The Diocese of Green Bay put together a Parish Primer. And Kenny Jahng shared some Pokemon Go graphics you can use. The Pokémon Go app isn’t even a week old. Aren’t we jumping the gun? This may be a fad that burns out and crashes and we’ll remember it like Friendster and MySpace. But right now, it’s huge. The sudden explosion in popularity is unprecedented, and that’s worth taking a closer look. It’s probably a little early to ditch your communication plan and do a Pokémon battle during the sermon, but handing out water and asking passersby how their Pokémon hunt is going? That’s just being nice. 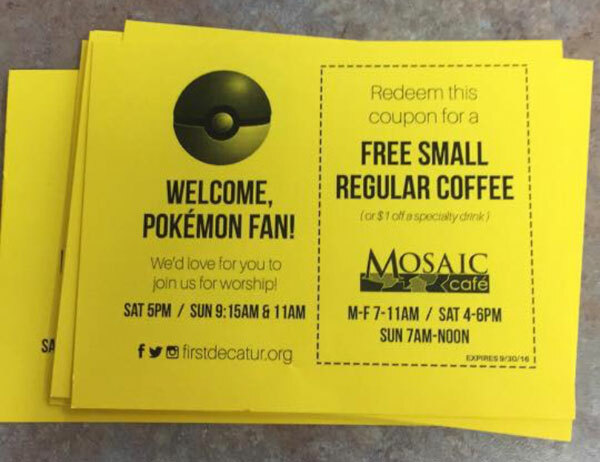 First Christian Church in Decatur, Ill., put a slide on their digital sign and put out a ziplock bag with coupons for a free coffee. I’m kindasorta fascinated by how verklempt some church folk seem to be about how to “handle” all these visitors. Your suggestion about “just being nice” is a good one to which I’ll add that if a sudden influx of visitors actually wandering around/through your church is a challenge, probably time to have a conversation about what hospitality might look like if people just…drop in! Yup. It really is all about hospitality. We’re a Pokestop – I just tweeted it out. Gonna make up some pitchers of Lemonaide in the morning! The downside, the Catholic Church just across the intersection from us is a gym so they’ll get more of the “hanging out” traffic than we will.